I am a designer/maker of a woman’s sustainable clothing line and my husband is a ceramic sculptor. We work from our home in Albany, Ohio where we raise our two kids. 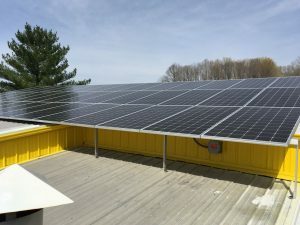 Both of our businesses are now powered by solar. We both believe in the importance of investing in renewable energy for environmental and economic reasons. Much of our production is electric including a woodshop, ceramic kilns, mixers, compressors, forklift chargers, sowing machines etc. 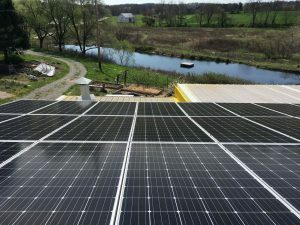 This installation has drastically reduced the energy cost of our production while at the same time reducing our dependence on our local coal-fired power plants. When the sun is shining, I like that the energy our system is producing is going directly into the equipment that we are using. It seems like one less thing to worry about and allows us to focus on issues that are of more immediate concern either in our businesses or our community.